A 177 centimeter-tall teenage girl was an instant eye-catcher as she climbed on the bus. Her height didn't allow her to stand upright. 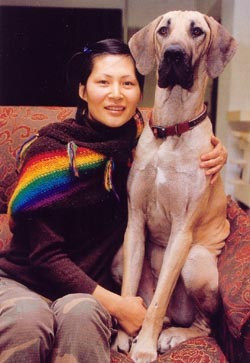 Choi Miae, 38, could not have known that her extraordinary height would lead her to an equally extraordinary life in many respects: Miae became a model and married French fashion photographer Jean Louis Wolff in 1992; She became infected with ber husband's love of travel and even decided to live in a bus! To top it off, she even crossed continents by bus aIl the way from Seoul to Paris and back. Four years ago, while struggling with their budget and their landlord, Miae and Louis decided to buy a bus. Miae round the idea too radical for ber lifestyle standards when Louis had first suggested it, but one day, on her way home after work, a bus parked along an Itaewon street caught her eye. Watching the bus, she round herself envisioning rooms, a bathroom, a kitchen... in a bus. Her heart swelled with hope. Her lifestyle standards crumbled. "The best thing about living on a bus is you have a different front yard when you wake up in the morning," said Miae, as if talking about some kind of magic. After modeling for 10 years, Miae became a make-up artist in 1998 and worked as Louis' partner on photo shoots. By 2000, years of incessant work had begun to stifle Miae and Louis' inspiration and passion. They determined they needed a 'change of air.' Then their "Beauty Project between Seoul and Paris" came about. Their plan was traveling in their bus from where Miae was born to where Louis was born. Along the way, they would do photo shoots of local women. Fantastically adventurous as it may sound, setting out on a journey across China and Russia to Europe was Dot an easy decision; They already had two kids, Yigureum and Lilas. Yigureum (meaning 'this cloud') or Marc as he was called in Frenh, was eight years old, while Lilas had just celebrated her first birthday. Yet this adventurous couple believed that they would learn and gain more from travel than they would by staying in Seoul. Seoul-China - Kyrgyzstan - Kazakhstan-Russia-Turkey-Greece-Italy-France; and back to Italy-Greece-Turkey-Iran- Pakistan- India- Nepal-China-Seoul. was not the only reason Miae's family decided to take the same journey back to Seoul. An air flight back to Korea would land them right in the middle of severely cold weather Se ouI. And they were running out of money. They would need a miraculous plan to se cure a warm residence and, sadly, to feed the family. ln addition, they could barely afford to travel back to Seoul with borrowed money and earnings from broadcasted video footage of the trip. So, Miae proposed to return to arrive in Seoul after spring Seoul in their bus. They would think up a plan on the way. Their return itinerary was even harder and more dangerous. As a result of the Sept. 11 terrorist act on America a few months before, travel through Iran and Pakistan had become deathly hazardous. A U.S. B-52 bomber headed to Afghanistan fleeted overhead while Miae was posing for a picture with local men near Pakistan's border. Other dangers and discomforts followed. 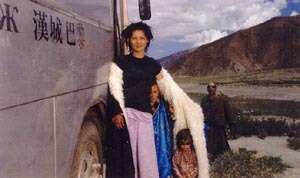 For example, in Tibet's highlands, Miae fell prey to altitude sickness. Although she reached her physical limit in Tibet, the land left her with the greatest impression throughout her travels. "Tibetans were poor and didn't care to clean themselves. But their live was close to nature and beautiful. I would never see smiles like they had in any other pla in the world. They made me think about the very soul of human life." Miae and Louis' 318 days of travel finally ended in Seoul on July 14, 2002. They had to fight through fatigue, low finances, and emotional friction with their traveling companions (A few other people accompanied Miae's family as guides and photo-shoot support). At some points circumstances were so stressful that Miae and Louis even reached the brink of breaking up. Nevertheless, her belief in learning from the travel project proved true. Miae said, "It isn't the difference between cultures that causes problems. It's the difference of how you see the difference between cultures. Now the difference in perspective between Louis and I have narrowed a lot since traveling. And I value it morethan how much money we have." Miae's life vastly differs from the many stereotypes of Korean women. She did not travel the world by bus because she was rich. She did not decide to return to Seoul by bus again because it was the easier way back. She simply wanted to live the way she wanted and was ready to face problems as they came. Miae learned her instincts were right, so she won't stop taking other unusual steps. Leaving the Chinese port Tianjin, their last stop on the journey, Miae had said to Louis aboard the ferry, "I loved it when people smiled as you shot pictures of them. Someday, let's take portrait shots for elderly people back in Korea. l'Il put make-up on them, you take their last portrait shots, Louis." Miae has published a story of her and her husbands' Beauty Project travel (Miae and Louis' 318 Day Bus Journey published in Korean by Sein). She is now finishing a book "My Name Is Dino" about ca ring for dogs in Korea white Louis continues his photography career. They now live in a rented house in Itaewon and travel Korea in their bus on weekends. Written by Chu Miok, Staff writer Photographed by Lee Hwa Jung Travel photos by Miae and Louis. Img Miae with Dino. Dino is the eldest of nine puppies that Cocotte gave birth to after the journey. ¤ Miae & Louis Studio : Merci d'avoir publié encore quelque chose sur nous!